The Uptown Rebels came about in the year 1968 or 1969 at the intersection of Montrose and Malden in the Uptown neighborhood. The reason for the creation of the Uptown Rebels was the migration of African American and Puerto Rican families into the Uptown community that arrived in this impoverished neighborhood because of the cheap housing. The Uptown Rebels were the sons and daughters of impoverished southerners that arrived in the neighborhood in the 1950s when southerners were heavily migrating into this community. The gang was formed because they felt their way of life was being threatened and that minority groups were taking over the buildings they lived in. Vice Lords, Black P Stones and Black Gangster Disciple members were coming into the community along with African American migration while Latin Eagles, Latin Kings and Harrison Gents were coming in among the Puerto Rican migrants. One gang that arrived in the neighborhood that met the approval of the Rebels was the Gaylords that started at Sunnyside and Magnolia which was just two blocks away, the two gangs became really tight as they fought the black and Puerto Rican gangs. The Uptown Rebels focused more on fighting black gangs while Gaylords focused more on fighting Puerto Rican gangs then many times the two gangs would band together to fight all their enemies. In the late 1970s the Uptown Rebels opened up a cocaine distribution operation at the intersection of Montrose and Malden and were under the leadership of Randy Price and the Uptown Rebels dominated the apartment buildings at this intersection while moving cocaine in and outside of the buildings. In the year 1980 the Uptown Rebels joined the People Nation alliance alongside the Gaylords which meant the Rebels had to lay off Latin Kings, Vice Lords and El Rukns (Black P Stones). 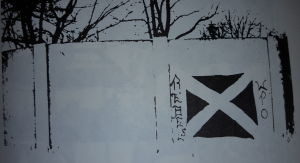 The Rebels did find a new enemy, the Brazers that arrived in the neighborhood by Chase Park so now the biggest enemies of the Rebels were the Brazers and Black Gangster Disciples. The Rebels and Gaylords connected with white supremacist leader Jack Quinn who became the leader of the Chicago chapter of the Ku Klux Klan, Quinn connected with the youths of the Gaylords and Rebels and together many hate crimes were committed in the Uptown neighborhood that included a black man being beaten to death by a member of either the Gaylords or Uptown Rebels in 1986. In the year 1984 a documentary on the Uptown Rebels was made which was the first time public attention was paid to the street gang. Hate crimes became the main M.O. 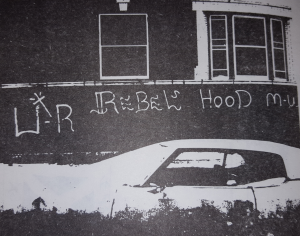 of the Rebels especially hate crimes against members of rival minority gangs, by the late 1980s police began applying heavy pressure on the hate groups of Uptown and this led to the decline in Uptown Rebel numbers, also the leader Randy Price moved to Kentucky and was arrested on drug charges in Kentucky. In the year 1990 the Uptown Rebels officially closed their operations. Did the Rebels form in 1968 or 1969? Did the Rebels have any other sections besides Montrose and Malden? If so what years did they open and close? What was the name of that 1984 documentary and how can it be watched? What Jack Quinn ever a Rebel?